I resisted the urge yesterday, but I'm not sure I can today. That tree is calling me and pleaded to be relieved of her duties, free from the burden of the many many ornaments, and delivered to the goat pasture to be devoured. Each time someone jumps nearby it (and that's a frequent occurrence, I can assure you), another hundred dry needles fall to the floor. We got it up early, this year's tree, and I'm not sure it got the water it really needed. But that's not the real reason - I'm always ready to let the holidays linger in a different way. Clearing away some of the clutter of Solstice and Christmas to make way for this quiet and mellow week of post-holiday land. A week with hardly a thing on the calendar, except enjoying each other and home. Finding a place for new treasures, and maybe clearing out some old. Ah, I do love this part of the holiday season so much. This week, here at home, we're enjoying hanging up some new art (I had a grand time picking out some new things from The Little Friends of Printmaking while in LA earlier this month). There has been a constant game of chess played by someone or another (so much so that we're plotting a permanent chess table to take the place of that tree when it comes down). And we're so enjoying all those leftovers, making meal time as easy as pie (well, sometimes it is pie). I haven't picked up the knitting needles in days, but I might today. I feel ready for a good long sweater of a project. It's that time of year, I think. I hope you are all feeling the same = that your days are bountiful and full of blessings. And that we feel full of gratitude for all of it. We, like you I'm guessing, are in the thick of it! We had a most magical Solstice day, full of all our family traditions - from the winter walk and bonfire and setting intentions for the coming year, to our feast and gift exchange around the tree. I've said this before, but it is such a delight to watch traditions that have taken root, take on their own life and energy - just as a tradition should. If I forget to make the sun cake, Adelaide will remember. If we're rushed about getting the wood gathered for our fire, Harper will have already done it. These things we do, that initially felt 'made up' all those years ago when we started doing them, are now theirs so fully and deeply. It's a beautiful thing to behold. Adelaide and Ezra are in a play currently, with no fewer than three performances today (it runs next week too! Go see The Lion, The Witch, and the Wardrobe with your littles if you're local - it's so sweet!). Calvin leaves soon for a ski trip with his nordic team, and I'm fairly certain he outgrew everything he wore last year. Next week, we pick up our French exchange student and I have yet to finish preparing a space for him. The list goes on. But all of those things will pause for the next two days while we embark on our Christmas celebrations. The very traditions that Steve and I grew up with knowing and loving - celebrating with family, and oh so many cousins. There will be stockings in the way we do them, and hot cocoa in the morning out of our santa mugs and a whole lot of love and joy. It is one of the greatest joys of parenting to share our childhood traditions with our own children....all while adding our own along the way. I wish you and yours the merriest of days ahead! Full of laughter, people you love, and the traditions you treasure. I put the call out on Instagram a few days back, as I realized it was time to make cookies but we didn't have a gluten-free recipe we knew and loved yet. That's kind of the way it's been going with the switch to gluten free around here - we've just adapted without a lot of fuss. I hardly notice the absence of it in our cooking or daily meals, until one or another tradition or 'favorite' things comes up and I am reminded. Such as this week, when I thought.... Right! Sugar cookies! I have not found subbing gluten-free flour for regular flour to be an across the board good solution. The results often feel lacking, and so we end up just doing without this, that or the other bread thing and are fine without. Rather, I've found success in recipes that were made to be gluten-free naturally - not adjusted to be so. Does that make sense? On that note, here are a few that we have tried this week or are going to try, thanks to the suggestions sent our way. Not only are the individual recipes wonderful, but each of these blogs are a treasure trove of goodness! Fluffy Vegan Gluten Free Sugar Cookies by Minimalist Baker - (We are able to do dairy, so ours weren't vegan.) This recipe is hands down our favorite now! It is the first cookie since my celiac discovery that tasted like, well....a really good cookie. I didn't know I was missing cookies until these showed up in my kitchen earlier this week, courtesy of Adelaide, our resident baker. Paleo Snickerdoodle Cookies by The Urban Poser - Snickerdoodles are such a family favorite, maybe especially because of the one time when Ezra was an early reader and made them all by himself. But he read the fraction of 1.5 as 11 cups. And therefore made them with eleven cups of sugar. Bad parenting oversight, but a great family story. (And no one has any idea still how it is that I had eleven cups of sugar in the house.) Anyway....these cookies were not only delicious but give us one more opportunity to tell that story. Gluten Free Chocolate Crinkle Cookies by Gluten Free on a Shoestring - Adelaide loves making Crinkle Cookies, and so she was happy to find this one, which with the addition of just a bit of xantham gum, work just like her gluten version. Gluten Free Scottish Shortbread Cookies by the Nourishing Gourmet - Um, I really really love shortbread. I can't tell you how happy I am to have discovered this and fallen in love with the taste of them. So very good. Rosemary Cookies by The Year in Food - We have not tried these yet, but looking at the ingredient list and those photographs, they're on the schedule for tomorrow. They have to be! Thankfully, there are a loads of rehearsals, practices and parties happening this week, and so all of these cookies are making their way OUT the door just as quickly as they make it out of the oven. Which not only prevents us from eating them all, but also clears room and provides justification for trying more. Right? The truth is that I'm NOT reading this book because I do not read Portuguese. But! I can't tell you how many times I've picked this up off the coffee table to flip through, and I'm not alone in that. Rosa's book is full of old photographs of fiber folks, tools, as well as contemporary designs and patterns. And from her illustrated instructions, I just might sort out knitting Portuguese style - you all really have that purl stitch going! I can't tell you how excited we all get when a new Elsa Beskow illustrated book is released from Floris. Obviously, I'm not alone in my love for her simple and pure style of telling a story, and I am so thrilled that they keep discovering and releasing more of her work for all of us who adore it. This one, illustrating the classic Hans Christian Andersen tale, is no exception to that sweetness. So dear. We have read so much of Astrid Lindgren's writing (oh, do be sure you go beyond the fun that is Pippi! She has so many other wonderful tales! ), but this one escaped us until a Swedish friend of ours directed us to it. I'm so glad she did - this tale of friendship is a wonderful one and made for such great nighttime story reading. I wish you many happy hours of reading this holiday season, friends! Follow Whole Family Rhythms on Instagram. Since my last visit to SouleMama, I have added a new eBook to the shop: Whole Family Traditions. Creating a meaningful and conscious holiday season that is in line with your family values can be challenging for the current generation of parents. There are many of us who do not hold strong religious beliefs or adhere to many of the rituals our Grandparents did, but who would still like to retain a strong sense of family spirituality, gratitude and reverence in connection with the holiday season. Here at Whole Family Rhythms, we believe it is our human responsibility to make a real and daily effort to walk in the footsteps of others. An interfaith dialogue is essential to this process. Although the purpose of this new Guide is to help you and your family find and create meaningful traditions that are authentic to you, it is my hope that it also promotes acceptance and can help to shed light on how others choose to pass their values down from generation to generation. Whole Family Traditions includes many worksheets, editable lists and printables to help you and your family gain clarity on what you want to celebrate, why and how. The Winter Guide includes twelve weekly guides consisting of a weekly story, hiking theme, recipe, seasonal craft and themes for watercolour painting, drawing and beeswax modelling, an Ingredients and Supplies Master List, Seasonal Book Recommendations, Twelve Weekly Caregiver Meditations and Three Caregiver Handwork Projects. In addition, Whole Family Rhythms would like to offer all SouleMama readers a coupon code SOULEFAMILY for 15% off the Northern Hemisphere Winter Guide and the Southern Hemisphere Summer Guide. Expires 12/26/16. what our family needs! thanks for the chance! We are an independent manufacturer and retailer of fantastic made in USA products. We do all artwork in-house, and we work with small sewing, dyeing and printing shops in Los Angeles, California Everything we do is a labor of love! We produce our clothing from the ground up, by having fabrics custom knit, sewn, dyed and printed and then shipped to Michigan (our headquarters) for an extra wash, quality control and shipping. We are a small operation, and we believe that quality is the most important thing. We don't want to make the cheapest throwaway products, we want to make the best products that last, right here in the USA. We are constantly updating our styles, designs, colors and re-inventing ourselves. Every season we offer a new product line, full of varied inspirations, from vintage clothing and furniture to paper cutting, kitsch and quirkiness, and nature! We are much like the platypus, a cornucopia of interesting qualities developed thoughtfully over time. Heidi: Since the last time we were featured on SouleMama, we have started a BLOG! We wanted to share some aspects of our lives, including baking projects, craft projects, fun places we go, coupons for deals on www.blue-platypus.com, and little interesting facts about production, our inspirations, and why we are different from most clothing lines out there! Lady Gingersnap of the west coast and Mme Paisleytie of the midwest are teaming up to present you with many intriguing posts about whatever inspires them! A festive GIFT PACK! Winners can choose between #1, #3 or #7 ((we can substitute if for some reason your size is out of stock). In addition, Blue Platypus Clothing would like to invite all SouleMama readers to use code LASTMINUTE for 25% off orders of $100+ (must be placed by Monday Dec 19 for Christmas delivery). Expires 12/30/16. Love! Perfect for holiday gifts. My knittin' kitten tee is my favorite shirt! Love this shop! Ezra and I are back in the land of real snow (as opposed to that last photo!). But oh, what a wonderful west coast weekend we had! We were so thoroughly loved-up and graciously hosted by Carrie-Anne, who inspires me so as both a mother and an entrepreneur. In our quick trip, we certainly managed to squeeze in a whole lot of goodness! Ezra saw the things he wanted to see (though I know he'll be back there again someday), we stepped foot in the ocean, visited both Renegade Craft Fair and Echo Park Craft Fair (holiday shopping done, hooray! ), and wrapped it all up with a visit to Universal to see the world of Harry Potter. And somehow, I managed to knit four hats! But mostly, it was all about connection. Connection with a friend where we had the pleasure of taking our conversations beyond the phone and into the real world of late nights in the kitchen and early mornings by the fire. And connection with this 13-year-old boy of mine, without siblings vying for time and attention or our day-to-day distractions in the way. Solo time with our children is such a treasure, and for this guy and this time, I am so very grateful. Winter wildThings are back and better than ever! With a new lower price, and an even cuter brimless design, our ear hats are super-warm winter hats kids WANT to wear. Available in 3 very flexible sizes, your winter wildThings hat will last for YEARS! Our wildThings hats come in babies (0-14 months), kids (14m-12 years) and grown-ups (12 years and UP!) And yes, it's true! We have a grown-up size-- perfect for you to join in the fun with the kiddos! We're proud to introduce the brand-new Pantone Collection of wildThings. These rich, saturated solid color corduroys are paired with colorful Polartec fleece in coordinating and contrasting tones... and dressed up with fun ears in all shapes, colors, and sizes. Best of all? You can design your own-- choose your own ears & your own colors for an ear hat experience that's totally unique. Like you! Make your own Pantone WildThings hat here. In addition, Urban Baby Bonnets is happy to offer all SouleMama readers a 10% discount AND free shipping on any Pantone Collection (even customs!) wildThings hat with code pantonesoule. Good through December 13 with delivery guaranteed for Christmas. WoolyMossRoots is a place for nature lovers! And a haven for knitters, gardeners & creative spirits. Our online shop offers wooden jewelry, artisan buttons, shawl pins, cedar garden and homestead signs, and more, for the loved ones on your list this holiday season. Join us on the blog! Taryn: We did a fun photo shoot with friends and I've been enjoying adding more jewelry to the shop with all the beautiful pictures that were taken. In other exciting news: I love knitting and have been dreaming up lots of patterns over the years to make with WoolyMossRoots buttons. I'm happy to say I just published a cowl pattern that has been years in the making, Comfort Cowl, and it feels great to finally share it with the world. (You can find it on Ravelry, and on Etsy.) It's so cozy, and simple to make. It's a great pattern for beginners and for everyone who appreciates the satisfaction of a quick project. I also think it's the perfect knitted accessory for mamas to wear while they snuggle their little ones! A $50 gift certificate to spend in our shop! In addition, WoolyMossRoots is happy to offer all SouleMama readers 10% off your order with coupon code PEACEANDJOY. Good through December 17th. I love wooly moss roots and their gorgeous products and such a beautiful family! To a certain extent, parenting from the very start is about letting go. The 'leaving' that they do begins the moment they enter our worlds. Dramatic, yes, but true. From rolling to walking to, well, flying. I've felt what I think to be the healthy balance of that all along the way in our mere 16 years of parenting thus far, but am feeling it strongly and differently at this very moment in time. We bought our eldest, Calvin, a truck - a fabulous beater of an old thing (as one's first car should be, my husband deeply believes which I equate to a rare sentiment of 'we suffered and survived and so shall they!" from him) - so that he could have the independence due a nearly sixteen-year-old boy (and maybe also so that we can do a little less shuttling ourselves). But as excited as I am for him to have that freedom, which I trust and know he'll use wisely, I also mourn the loss of all that time we spend together talking and connecting in the front seat of a car. At the same time as we prepare for that new phase, I just this week purchased his ticket and made final arrangements for his solo journey to France. He'll spend a good part of his spring semester on exchange there. After so much talk and preparation for this adventure, I felt nothing but joy and excitement for him when I announced the dates had been chosen and the tickets purchased. We cheered together. And then, after a moment, I quietly remembered to myself just how much I'm going to miss him. Yesterday, Ezra and I boarded a plane for our own tiny little adventure on the West Coast, where we'll be doing just a tiny bit of work, but mostly visiting with a friend. I couldn't imagine coming to California without him, and so he came along - the one who has talked about living in San Francisco since before he could really say the name (and we still don't know where it came from), the one who writes scripts by night and improvs and acts by day whenever possible, and fits some music making in between that. As we flew over the city, before we had even landed in Los Angeles, he said, "I could live here..." I know you could, honey. And you just might someday. And how exciting will that be, I thought! And then, the familiar feeling post-joy, of knowing just how much I would - and will someday - miss him. Ah, the bittersweetness of it all! I am feeling it truly and deeply at this moment in life. And the only way I know how to channel those feelings is to direct them into the right here and now with what is in front of me. And for today, that means a young guy who is eager to see a city, a boy who has his whole world and life yet still in front of him. And how lucky am I that I get to be here this day with him? A lucky Mama indeed. With ever fiber of my being, I intend to be here with him. Here we are, already many days into December! We began to 'deck the halls' a bit here and there, and kicked off the month by hosting a family party - with 16 cousins under the age of 15, oh my! There's no better way to get in the spirit than that, to be sure. Family fun, cousin laughter, traditional family food and drink, singing around the piano, and a blessedly trashed house (ha!) at the end of the day. Then to end it all? Our first proper snow of the season. Yes, yes, yes....December is upon us. We have more halls to be decked and more merry to be made, and I look forward to the month ahead to do just that with those we love. Jan: Over the last 10 years, it has gotten increasingly hard to find garments to print on that are made in the U.S. This is especially true in women’s and girl’s clothing. We’re so deeply committed to seeing the revival of the American textile industry but it has been a challenge to fill the needs of longtime customers who are looking for garments that are no longer manufactured in this country. So, for 2017, we will begin producing a small line of clothing sewn by us, to fill in the gaps of what is currently available. Of course, this will be in addition to our usual line of t-shirts, onesies and accessories. Be on the lookout for our first new offerings in the early part of the new year! In addition, Silk Oak is happy to offer all SouleMama readers 15% OFF with SOULEMAMA coupon code good from today until December 11th. Love this company! Thank you for the opportunity! In addition to our shop we also share free crafts, activities and recipes on our blog and our recent book, IMAGINE CHILDHOOD: Exploring the World Through Nature, Imagination, and Play- 25 Projects that spark curiosity and adventure. Sarah: Since the last time we were here, we added a new generation and a sweet baby girl to the Imagine Childhood family! We are overjoyed and so in love with the little sweetheart. She has also taken quite quickly to her job as chief of infant product testing and generously volunteered to be swaddled in our organic swaddles and snuggled in our dream blankets. In addition, Imagine Childhood would like to offer 10% off all orders placed between now and December 7th, as well as free shipping for orders over $100. Use code "soulemama" at checkout. Discount expires 12/7/16. Such a special shop, we love their book! Thank you! Do you know that I've never done any stranded knitting? I don't know why, really. I suppose I thought it would be too attention-consuming for the kind of knitting that I mostly do (being that of a Mom usually doing more than two things at once). But I saw this hat on a Ravelry browse recently, and with a shawl off my needles and unfinished sweaters waiting that I just wasn't ready to dive back into, I decided to give it a go, stranded knitting and all. And after a few rows I had to laugh at myself for putting it off for so long. So straightforward, really and my hands quickly adjusted to holding two colors at once - apparently my thumb was hanging out doing nothing all this time and looking for a job! (I'm not sure what three colors would bring though.) They knit up easily enough, and using our own yarn, I began thinking that a stack of these might be just right for some holiday gifting. But apparently everyone around me caught onto the excitement I was feeling with these little hats, and they all started clamoring for their own. That photo of Harper up above? That's about thirty seconds of casting off - and it was on his head and he was out the door. Papa got one in brown and blue. Adelaide one in blue and white. And Annabel brought me some yellow and grey to start another. I'm so pleased to welcome the following Sponsors for December! Around the World Stories provides original audio stories for kids ages 5-12 to teach them about other countries and cultures. Each story is about 30 minutes long and focuses on the fun adventures of a child from another country. Kids will learn about how other children in the world live, play, learn, eat and speak; and they learn it from the perspective of a child. Each story also comes with a parent guide with discussion points, background information, printables and activities to help enrich the experience. 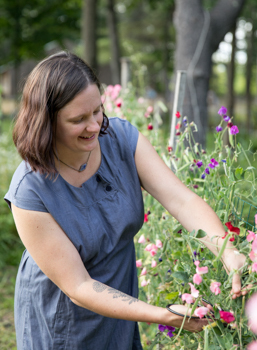 Gather & Glean is a mentorship and group coaching program for women who are passionate about homesteading and community. Facilitated by Teri Page of Homestead Honey, Gather & Glean will support you in getting clarity around your values and vision and taking action on your goals. Shine your brightest light into 2017 together with a deep community of like-minded women as we lift each other up to our highest potential!